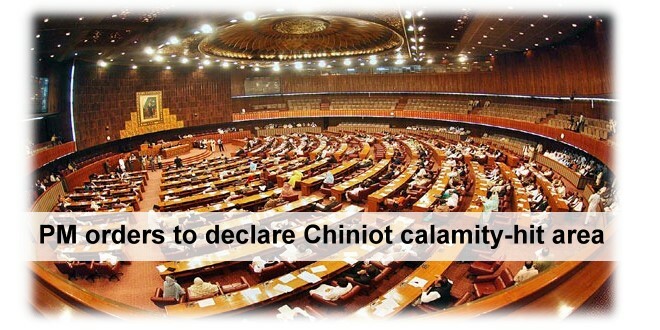 BHAWANA/CHINIOT – Prime Minister Nawaz Sharif on Friday said that the government would not rest until all flood-hit families are rehabilitated and get due compensation for their losses. Addressing a public gathering in Chiniot, the prime minister said that the affected families would be compensated for the losses of their houses, crops as well as livestock in the flash floods. “I assure you that the government will put in all out effort in this noble cause and will go side by side of you,” he remarked. Nawaz said that he had reached there to sympathize with the flood-hit families in the hour of distress, help mitigate their sufferings and also examine the relief efforts. “The Punjab government as well as the federal government will support you until you are completely rehabilitated.” he assured the gathering. He said that the government was entrusted by the public money that would be spent only for public welfare adding that in case any flood-hit family does not get its due compensation, both Nawaz Sharif and Punjab Chief Minister Shahbaz Sharif would ensure provision of its right. He also ordered to declare the area as calamity-hit and provide all due concessions to the residents entitled to them. Earlier, the prime minister was briefed about the flood situation in the area and the losses incurred by the natural disaster. Addressing a public gathering in Sargodha, the prime minister said that the people of this constituency were very dear to him as they had also elected him in the elections. He said that the Punjab chief minister was also visiting all flood-hit areas to sympathize with the affected population and examine relief efforts. He assured maximum government support to the flood affectees. He said the government would soon start work on rehabilitation of infrastructure including roads and prayed that the country gets deliverance from these difficulties. The prime minister committed to visit the area again to examine the disbursement of compensation amount and efforts to rehabilitate the area.